HOBOKEN, N.J. — John McCauley, gaunt and scraggly, clutched an electric guitar at Maxwell’s here on Monday night, finger-picking a lone song, “Houston, TX,” by himself. His band, Deer Tick, had spent the past hour digging into roadhouse country and rawboned rock ’n’ roll, with a bluntly effective fervor. This solo interlude seemed like an unscheduled detour, announced on the fly. But it was a clear, vital moment in an unfocused show. “Houston, TX” comes from “Born on Flag Day” (Partisan), Deer Tick’s winningly ragged 2009 album, and in the original arrangement it’s a lilting shuffle, offered in tribute to the Bakersfield sound. Here, Mr. McCauley made it more desperate, nearly unmoored. His voice — tart, coarse, with a liberal pinch of twang — felt painfully exposed, adding weight to his lyrics about cutting loose from an exhausted love affair. 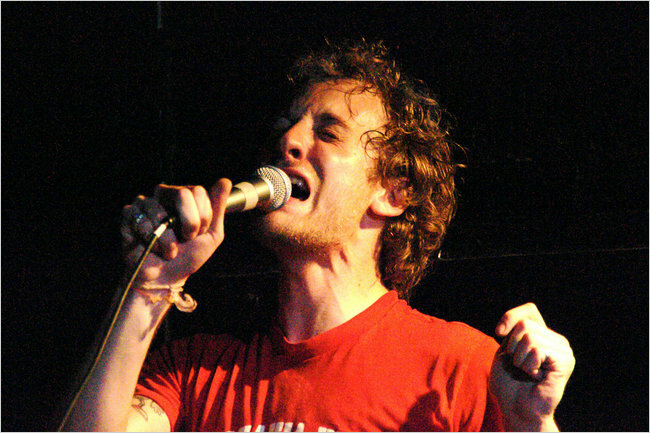 Since forming Deer Tick in Providence, R.I., late in 2004, Mr. McCauley has been both its engine and its engineer. Last month brought “The Black Dirt Sessions” (Partisan), another album stocked with his cagey, questioning songs. But Deer Tick, whose current tour will end on Aug. 13 at Webster Hall in Manhattan, seems to be in some kind of flux: this show included just a handful of tunes from the new release, most of them tossed off or hurried through. And the band’s frontman often took a backseat. He surrendered the wheel mostly to Ian O’Neil, the other guitarist in Deer Tick, and increasingly its other songwriter. “Hope Is Big,” one of Mr. O’Neil’s better songs, took the form of a heaving country waltz. Elsewhere he leaned more toward snarling honky-tonk, as on a stomping cover of Chuck Berry’s “Maybellene.” Mr. O’Neil was merely serviceable as a singer, which at least put him ahead of the band’s Amish-bearded drummer, Dennis Ryan, whose take on Marvin Gaye’s “Let’s Get It On” was pure stunt work, a floppy salute to Jack Black. It would be wrong and too facile to apply that lamentation to Deer Tick, which has a lot going for it as a band. But with the way things are headed, Mr. McCauley might consider a side project: solo acoustic, perhaps, so he could move along without actually moving on. Deer Tick will appear on Wednesday at Ottobar in Baltimore, on Thursday at the Rock and Roll Hotel in Washington, and on Friday and Saturday at Floydfest in Floyd, Va.; deertickmusic.com.